Lauren Kinnee, The Greek and Roman Trophy From Battlefield Marker to Icon of Power, Londres-New York, 2018. 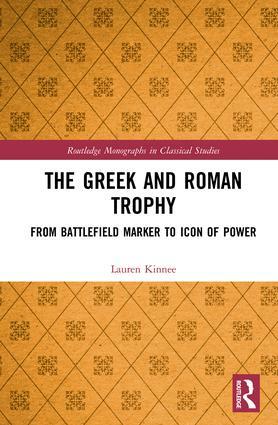 In The Greek and Roman Trophy: From Battlefield Marker to Icon of Power, Kinnee presents the first monographic treatment of ancient trophies in sixty years. The study spans Archaic Greece through the Augustan Principate. Kinnee aims to create a holistic view of this complex monument-type by breaking down boundaries between the study of art history, philology, the history of warfare, and the anthropology of religion and magic. Ultimately, the kaleidoscopic picture that emerges is of an ad hoc anthropomorphic Greek talisman that gradually developed into a sophisticated, Augustan sculptural or architectural statement of power. The former, a product of the hoplite phalanx, disappeared from battlefields as the Macedonian cavalry grew in importance, shifting instead onto coins and into rhetoric, where it became a statement of military might. For their part, the Romans seem to have encountered the trophy as an icon on Syracusan coinage. Recognizing its value as a statement of territorial ownership, the Romans spent two centuries honing the trophy-concept into an empire-building tool, planted at key locations around the Mediterranean to assert Roman presence and dominance.